Beautiful, baptismal kit for boys, in very intense color contrasts of red, white and blue. On the candle in a very beautiful way are tied fabrics that create bows in vivid colors. White colored lanyard is tied and colored textile cars. 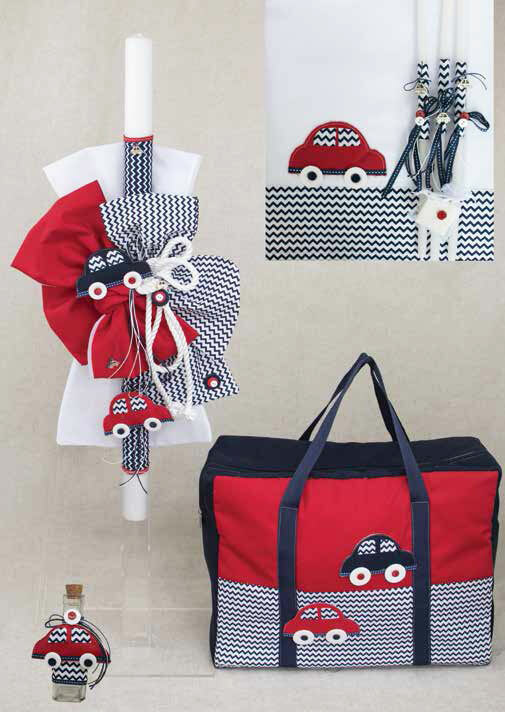 The large suitcase bag is dark blue combined with red and striped white-blue fabric and beautifully populated cars. https://www.preciousandpretty.com/2018/07/christening-set-with-cars-for-boy-E807.html Greek Wedding Favors|Orthodox Crowns|Stefana|Baptism Invitations Christening set with cars for boy E807 Christening set for boys, with colorful stars in red and blue color. Product #: Greek Wedding Favors|Orthodox Crowns|Stefana|Baptism Invitations_2653799731959515843 5 stars out of 5 reviews.